What toys did you play with when you were younger? I remember that one year, under the advisement of my mother’s co-worker, I was given a Kid Sister doll. It sat there in the box until it was donated to a school charity. No harm in trying, but I’m not a girly girl. I was a fall off the monkey bars and out of trees girl, who liked trucks, building blocks, crafts, coloring and of course, Play-Doh. That was me, and still is. It was the other day at Gluten Free Zone in Murrysville where I was reminded that my beloved Play-Doh is not gluten free. 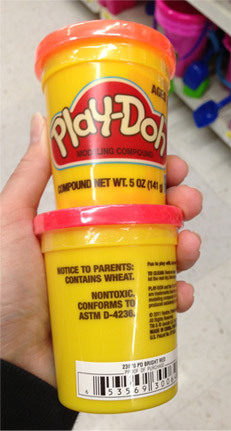 That’s correct, Play-Doh contains wheat. You may say, well you aren’t supposed to eat it. I agree. But while I may not have eaten it, I definitely recall licking my hands because of the salty residue I craved. Sounds gross, but as a kid you do those things, and if your child is celiac or sensitive, they should be given a safe alternative. A heavy box at the store contained just that. 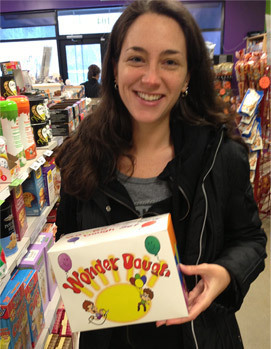 Wonder Dough is a gluten free Play-Doh alternative as is Colorations Wheat and Gluten-Free Dough which I’ve heard positive things about. Don’t like that idea or think it is too expensive? You could also make your own! And it is a project to do with your little ones as well! Talk about doubling the fun! I found a lovely site by One Creative Mommy that made and reviewed a few different do-it-yourself toy dough recipes. They are all gf. So take a minute and drop by her gluten free play dough recipes and decide which best suits you and your child’s needs. Happy sculpting!